My entire family was once locked in battle with someone over the plural of Canada Goose. Think about it. Feel free to argue among yourselves. Then click here for the answer. That really has nothing to do with this except that there’s a goose involved, so I felt compelled to share my one and only goose experience. Which sure, it is lame. But at least I have one. What THIS post is about, however, is a guy, a pickup truck, and a goose. 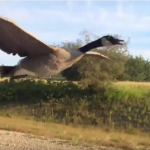 Apparently the guy was just driving along in said pickup truck when he notices there is a large bird following him. And being the good guy that he is he stopped, got out, and asked the bird what he was doing and if he was lost. The bird, of course, didn’t answer. (For the record I would have asked the bird a similar set of questions.) But he didn’t leave either. So the good guy, turned accidental goose whisperer, has an idea. He will lead his new feathered friend to a nearby lake. 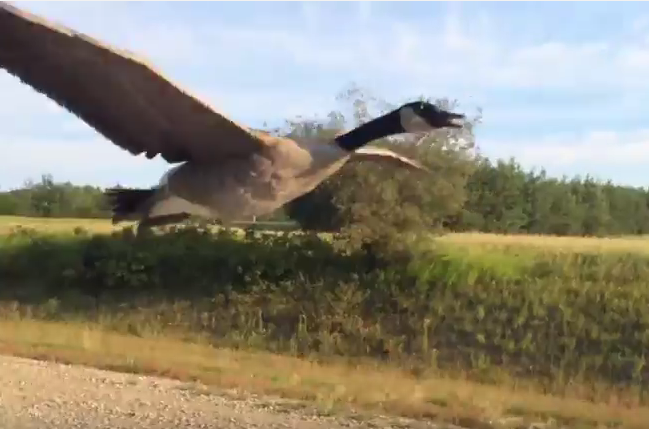 Then, like a freakin’ Disney movie come to life the goose follows him! He flies right next to the man’s window and there’s some incredible footage to prove it. When newly crowned hero, pickup truck and his buddy arrive at the lake the plan works. The goose seems satisfied to stay and sit a spell.